This is a scenic photo of a husky looking into the distance at some geese in Lake Tahoe during the Winter season. 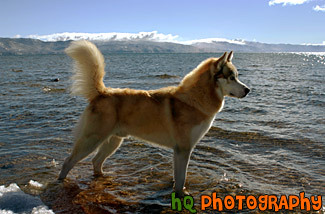 As you can see in the distance there is snow covered on the Tahoe mountains and ice near the feet of the husky. Even though it was freezing on the snow covered ground and in the lake, this husky hardly noticed the cold.